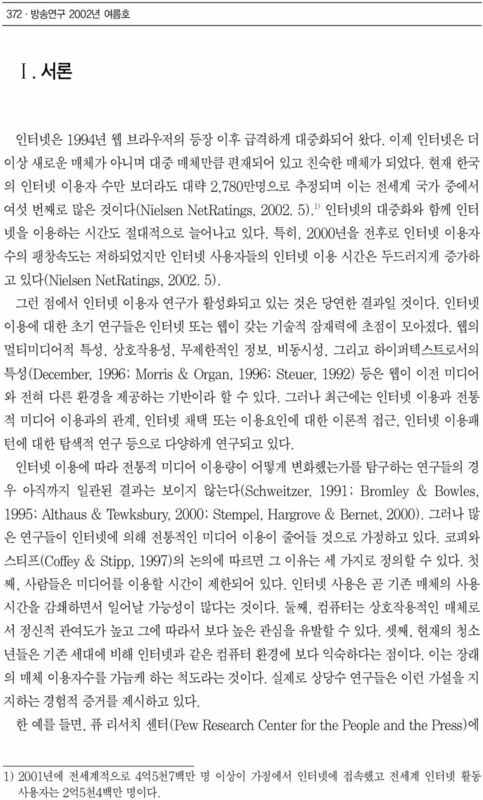 27 Abstract Web Repertoire and Concentration Rate : Analysing Web Traffic Data Yong - Suk Hwang (Research Fellow, Korea Press Foundation) In this study, the concept of web repertoire and the concentration of web using times are examined in order to analyze behavioral pattern of internet users. 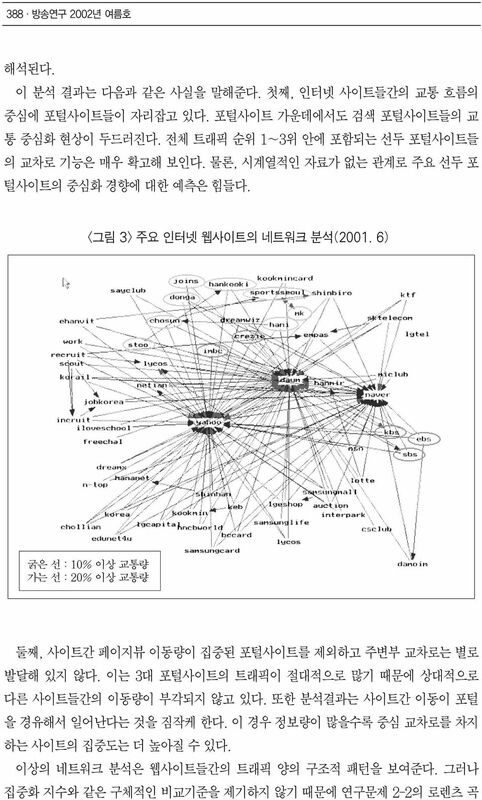 A hypothesis is made that although internet provides limitless technological potential to users, internet users display mass behaviors shown in the traditional mass media. 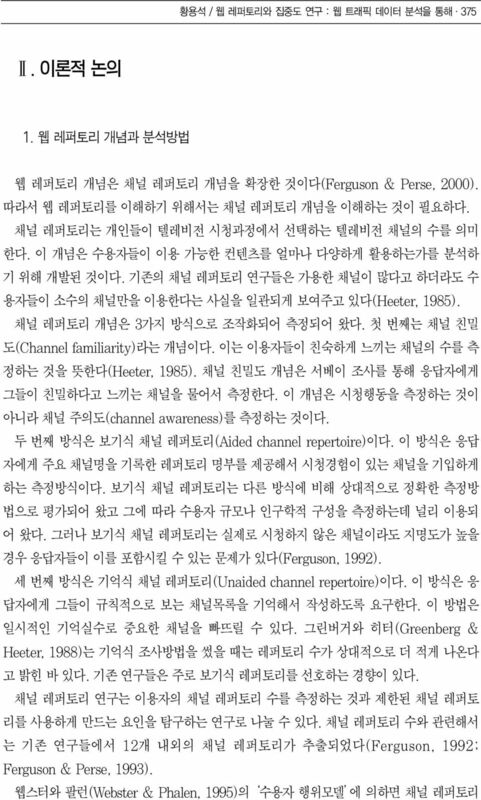 Web repertoire is a recently developed concept in which Ferguson and Perse(2000) expand the concept of television channel repertoire. The number of web repertoire is also a measurement of the activeness of internet users. This study attempted to complement the methodological problems of previous repertoire studies by using web traffic data. 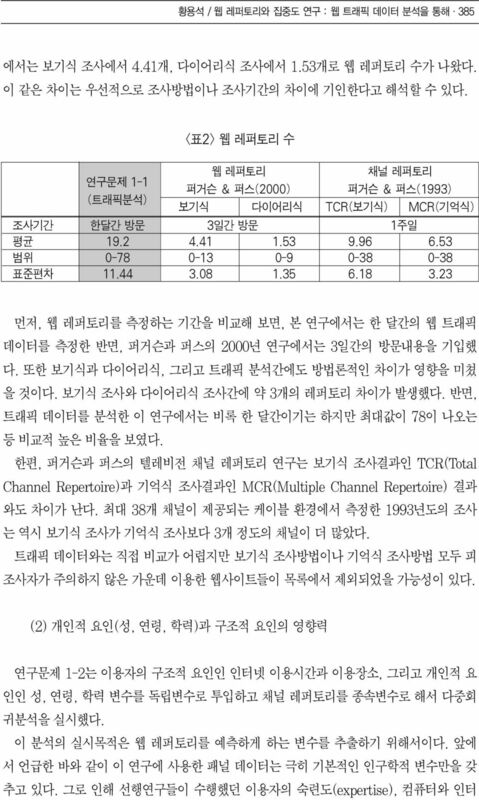 In this research, when the list of the number of sites visited from the top 100 sites during a month is complied, web repertoire is on average, Although it is higher than the result of channel repertoire researches, it cannot explain whether internet using behavior is more diverse than old media. 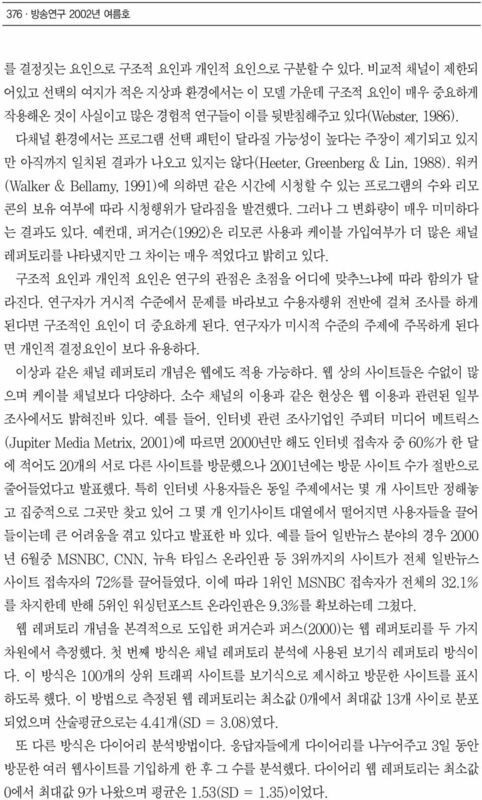 Because internet provides unlimited web site, unconditional comparison between internet and old media repertoire is insignificance. Instead of jumping to a conclusion on our result, we carry forward next research. Additionally this research analysis the determinant factor on web repertoire using multiple regression. Only on variable, internet using time, is statistically significant. 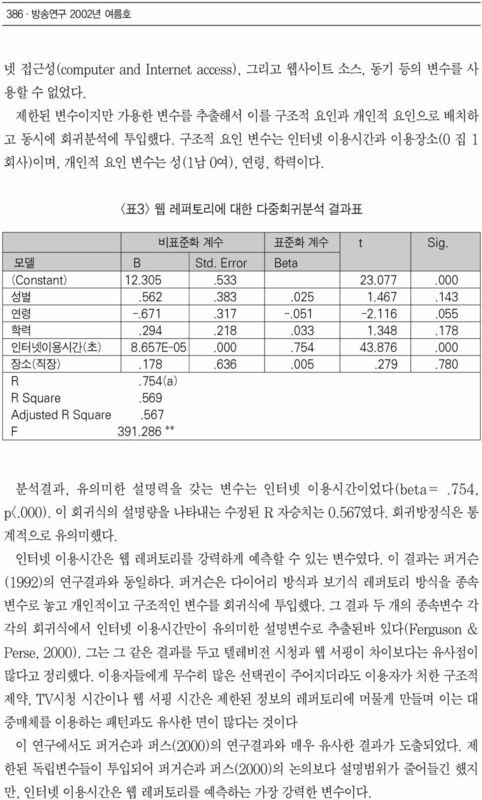 This result is similar to earlier research. Therefore, it can be concluded from data that despite of possibility of diverse information, repertoire is limited because of the structural constraint of limited time spent. The second aspect of mass behavior is the problem of consumer market concentration. 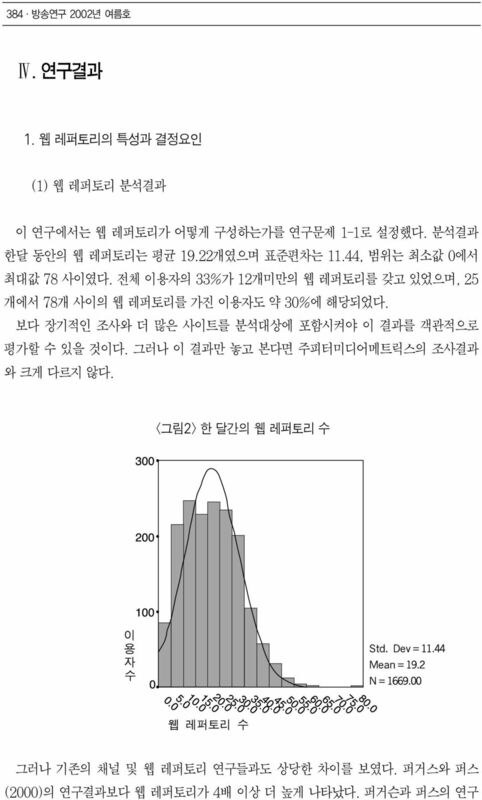 The result shows that previously applied statistical laws such as Pareto s law and 80:20 law from marketing research are also applied in internet. The evaluation of concentration ratio through Lorenz curve and Gini index reveal a high level of concentration with 10 sites occupying 71.9% of user time. Gini index of suggests highly unequal situation. 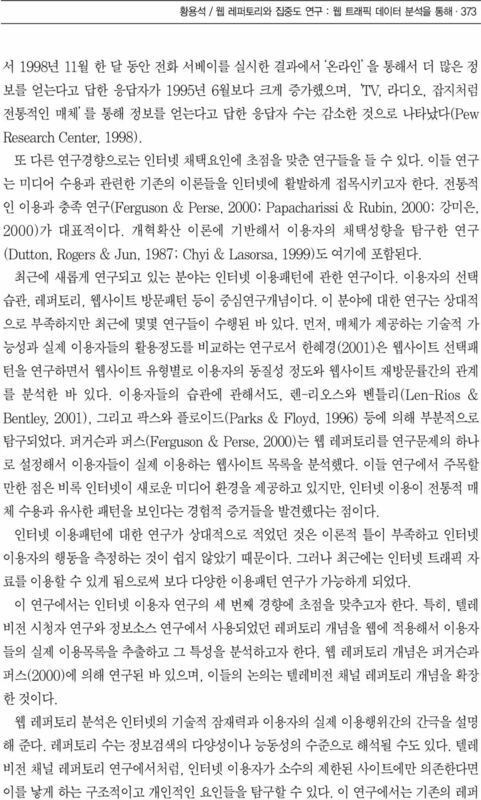 Repertoire and concentration studies are the typical researches about mass media. However, the fact that recent studies demonstrating that similar mass behavior is exhibited in internet demands further research. 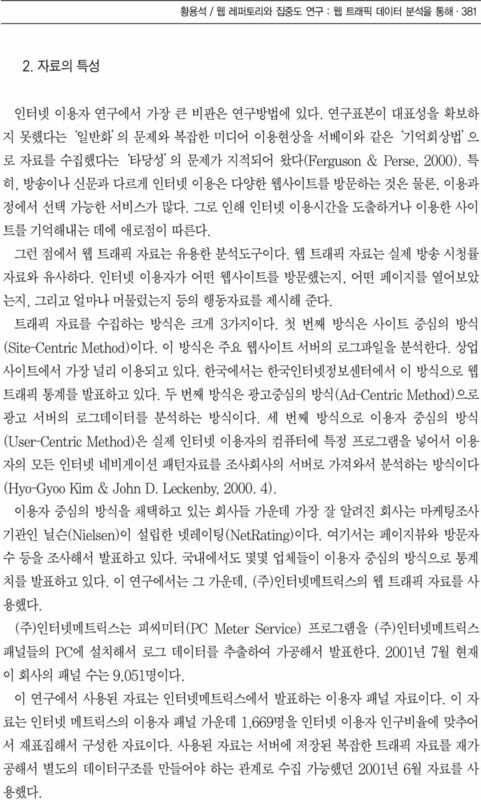 28 The significance of this study is that it makes a new attempt in the method of internet user research. 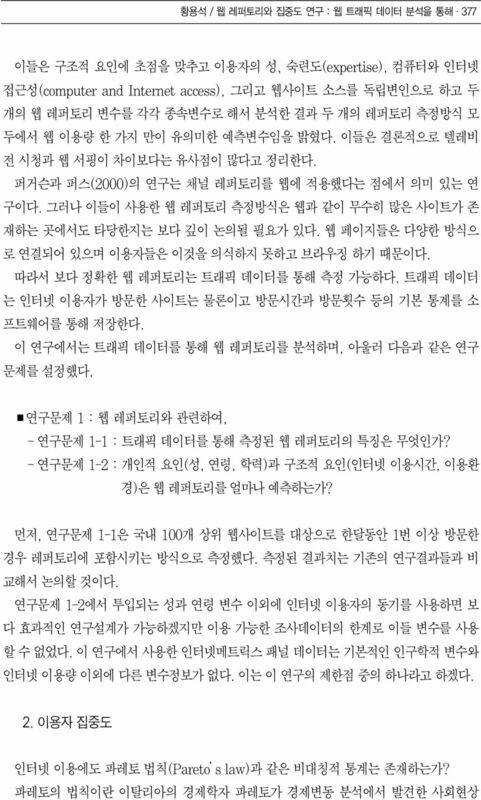 Although many approaches are made in studying internet using behavior, there are many unsolved problems in the area of research methods. Especially many researches have been criticized for the lack of representation in data collection. Since many studies have selected survey methods which depend on users memories, there have been difficulties in analyzing user behavior. In this aspect, this research is significant that it uses web traffic data which are like television rating data in analyzing user s behavior pattern. Secondly, this study compares repertoire measurement through traffic data to the measurement through previous measuring methods. This comparative data can be useful for future studies. 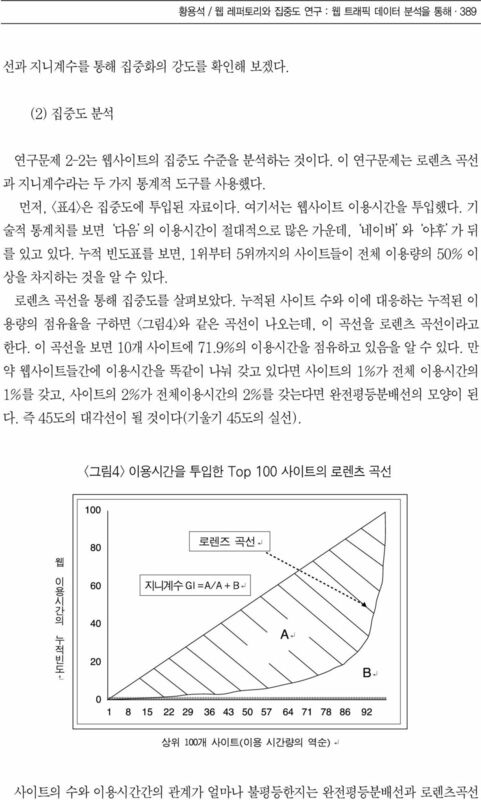 Thirdly, the study made a new attempt of applying the concentration concept from economics to the web use. 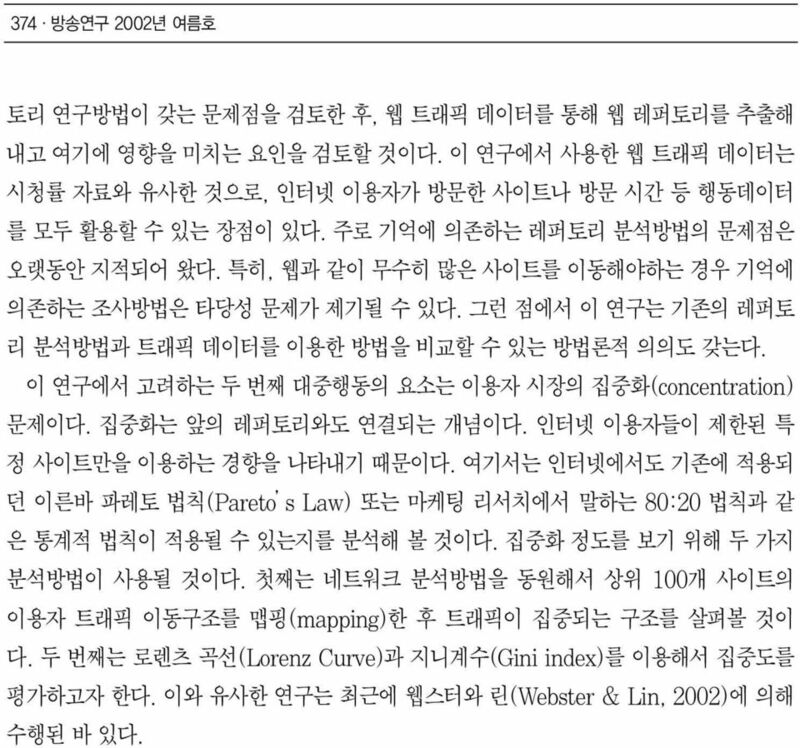 It is also notable that both Lorenz curve and Gini index are used in order to calculate concentration. 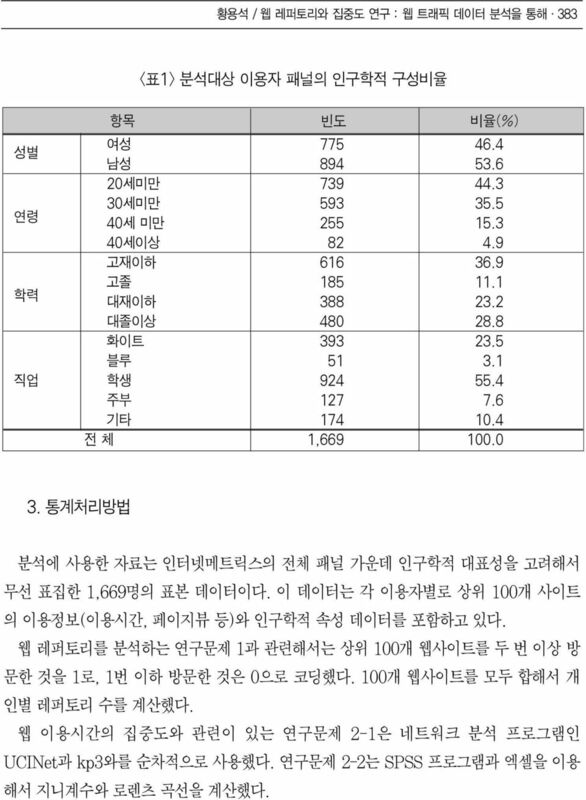 However, there are limitations in the study. Due to the lack of previous studies.